Raritan Paragon II CIM for PS/2, provides 2 channel ports and automatic skew compensation with P2-EUST. limited stock. 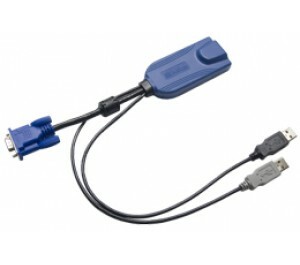 The Raritan Paragon II Computer Interface Modules (CIM) connects each Computer / device to the Raritan Paragon II Matrix Switching Unit via standard single Cat5 Cable. Computer Interface Modules (P2CIM-A): Provide all original P2CIM features PLUS automatic skew compensation when used with P2-EUST. When Supported by the New Paragon II User station P2-EUST means both manual and automatic skew compensation when used with the new Paragon II CIMs (P2CIM-AUSB, P2CIMAPS2, P2CIM-ASUN and P2CIM-APS2DUAL). Video redirection allows administrators to redirect a server’s video signal from one user station to another. Supports video resolutions up to 1600x1200 at distances greater than 213 meters and 1280x1024 at distances up to 1000 feet, with refresh rates of 60/75/85 Hz. NOTE: P2-EUST & P2-UST can be used with the same Paragon II UMT switch.